Meatless Monday is here and you probably thought I was going to skip it this week. I'm not, I'm here :). I wanted to post these recipes but wasn't able to make them until umm today. So, I'm a little late in posting but here it is! I'm posting both parts of the meal this time instead of giving you one recipe then having you look at the picture and wonder what the other stuff is or how to make it. 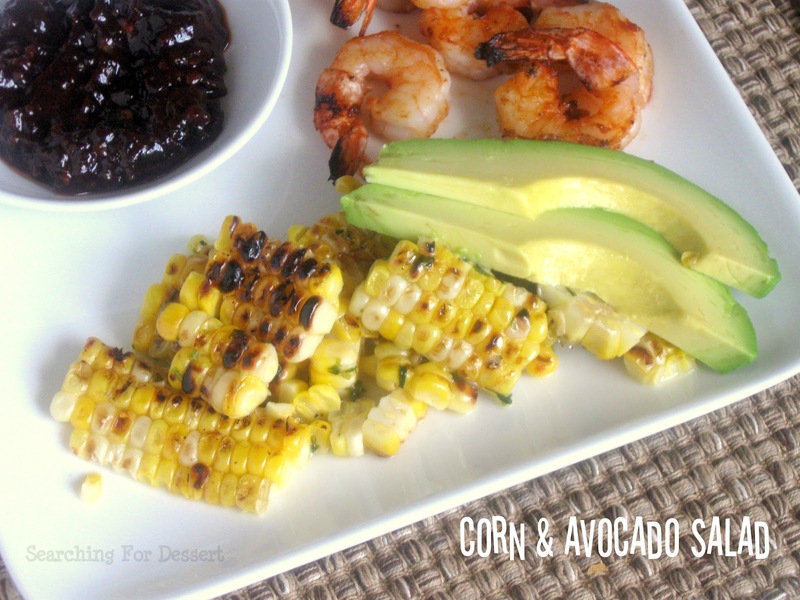 The first recipe is obviously the corn avocado salad but then second one is shrimp with an Asian barbecue sauce. Yum! Now, what's sort of funny is that while we were having dinner my husband was thoughtfully eating and thinks that the two sauces may be better if they are switched. The cilantro lime sauce on the shrimp and the Asian barbecue sauce on the corn (then grill it). It's a fun idea that we will probably try sometime. We both agreed that we would have both of these recipes again as they are because they are really good. 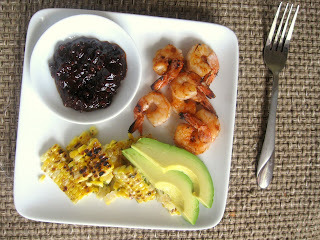 I know this is Meatless Monday and I'm posting a recipe with shrimp, but I eat shrimp see. Some vegetarians don't, some do, I do. If you don't, that's okay, just ignore the shrimp recipe :). The avocados are just supposed to be cut up and tossed with the corn but I think it looks pretty and I just cut it up as I ate it and it worked perfectly. There's not to much to say about the recipes except they're really good and you should try them! 1. Heat grill to medium-high. 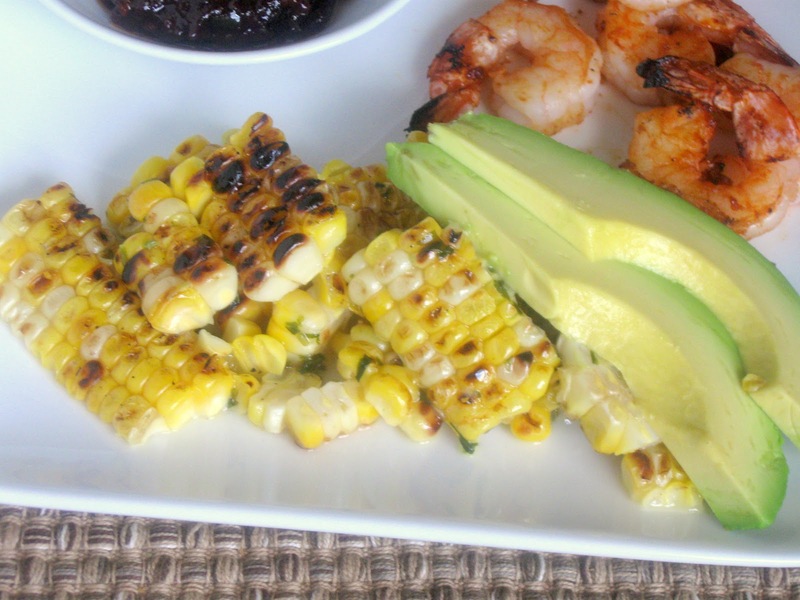 Grill corn, rotating often, until lightly charred, about 15 minutes. Let cool slightly. Carefully cut kernels from cob. Gently toss with avocado, cilantro, lime juice, olive oil, and salt. 1. Heat canola oil in a pan on medium. Add jalapeno, garlic, and onion. Cook about three minutes stirring occasionally. 2. Add the soy sauce, brown sugar, and ginger, bring to a boil. Reduce heat to medium-low and cook about eight minutes. Cool slightly. 3. Place the soy sauce mixture into a blender (or small food processor). Add in rice vinegar, tomato paste, and chili oil (or sesame oil). Blend until almost smooth. 4. 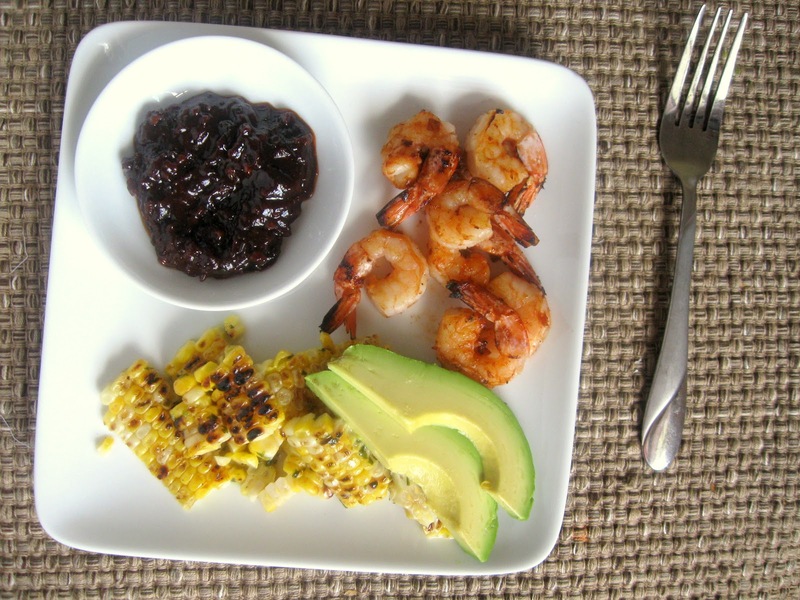 Toss the shrimp with two tablespoons of the sauce then refrigerate for at least 15 minutes. 5. Thread shrimp onto skewers and cook over medium high heat on a grill (covered) for about 4 minutes, turning halfway through cooking time, until pink. Serve with remaining sauce.